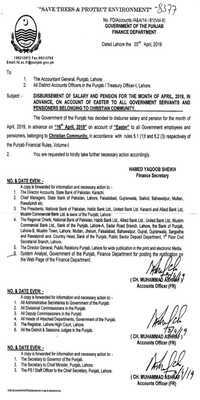 Finance department Notification Punjab Government has issued on dated Lahore the 03 April 2019 regarding Advance Salary on Easter weekend 2019 in the month of April for Christian community. Subject- - DISBURSEMENT OF SALARY AND PENSION FOR THE MONTH OF APRIL, 2019, IN ADVANCE, ON ACCOUNT OF EASTER TO ALL GOVERNMENT SERVANTS AND PENSIONERS BELONGING TO CHRISTIAN COMMUNITY. 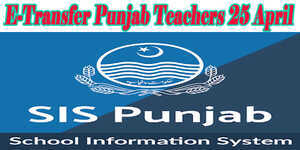 The Government of Punjab has decided to disburse salary and pension for the month of April 2019, in advance on "16th April. 2019." on account of "Easter to all Government employees and pensioners, belonging to Christian Community, in accordance with rules 5.1 (1) f and 5.2 (3) respectively of the Punjab Financial Rules, Volume-I. 2. You are requested to kindly take further necessary action accordingly.